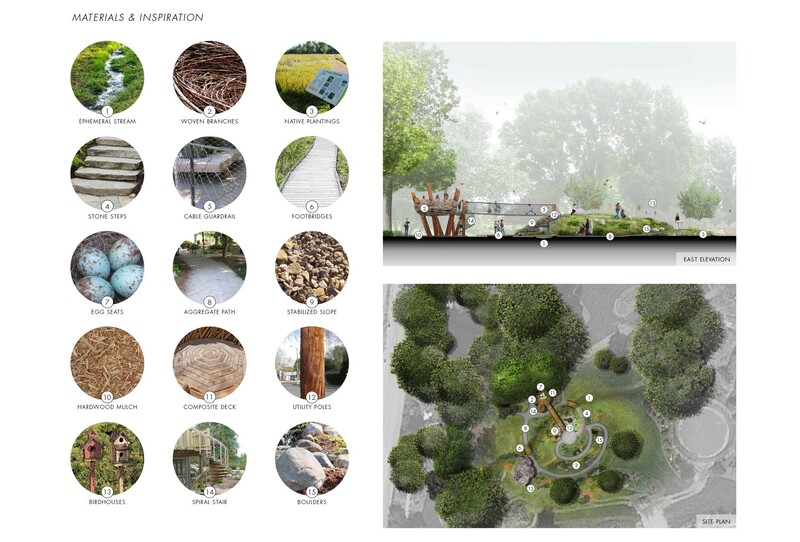 CRJA-IBI Group participated in a competition to design a treehouse as the signature element of the “Children’s Nature Discovery Garden” within the University of Tennessee Gardens. 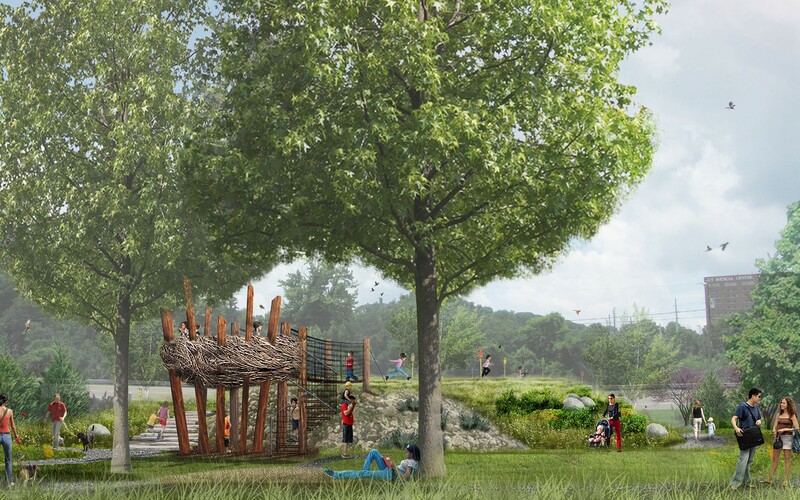 The treehouse design needs to speak to the theme of the Children’s Garden of “discovering elements of nature”….water, earth, sun, plants, wind, birds, worms, etc. Their goal is to encourage “Nature Play” to have children connect with nature by encouraging self-directed, informal play through natural elements and unstructured exploration. Inspiration for our entry in the Treehouse Competition comes from Nature and specifically from the ability of birds to enrich our lives through their beauty and flight…much like children can. Bird-themed imaginary play and the attraction of actual birds into a programmed landscape can provide a “unique opportunity for environmental education for children and families.” It can also foster a practical understanding of the intimate relationship between Nature’s flora and fauna while contributing to the Garden’s overall mission for its visitors. 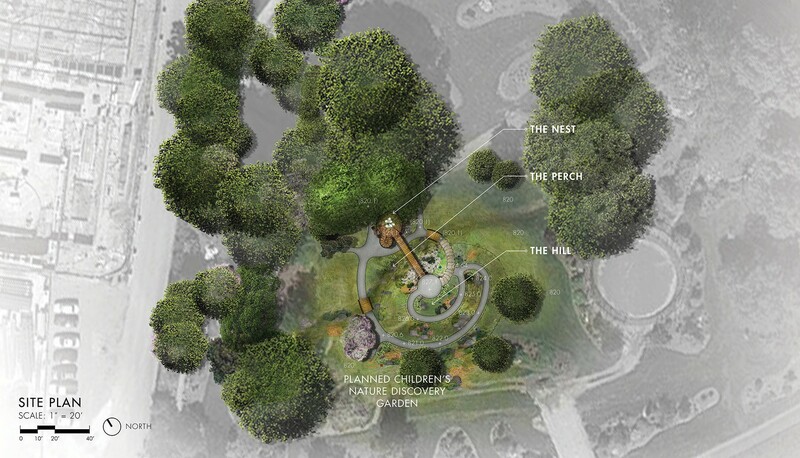 Our treehouse platform is conceived as a 16’ octagonal deck named The Nest and will serve as a focal element, destination and gateway for the proposed Children’s Nature Discovery Garden. Elevated eight feet above the existing gathering area and overlooking the Gardens beneath the existing Sweetgum canopy, it is accessed directly from below by a spiral staircase and on-grade by two nearby path connections – either as stone steps or a universally-accessible trail. These paths are incorporated into a vegetated mound we have named The Hill and lead to a suspended footbridge we have called The Perch. These meandering routes increase opportunities for discovery while providing choices for circulation and significant, complimentary components to our design inspiration. The Nest will greet its visitors as a playful and intriguing structure cloaked in woven branches to resemble a nest of the Northern Mockingbird, Tennessee’s state bird. 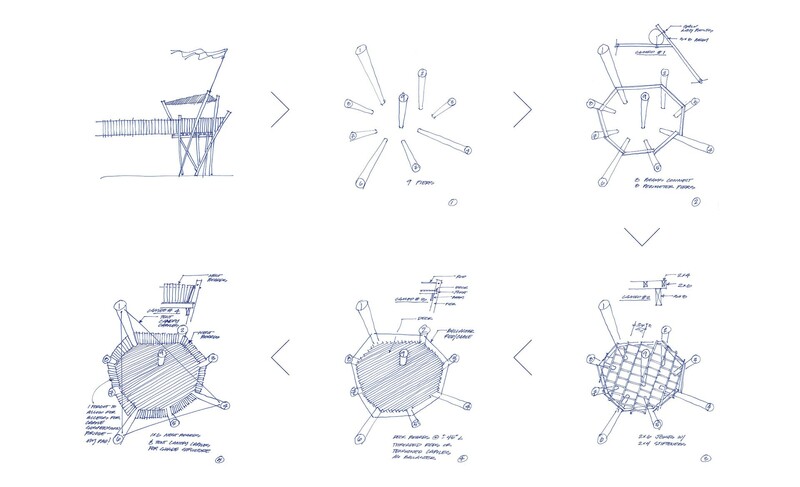 It is supported by reclaimed utility poles of various diameters that abstract tree trunk and branches. 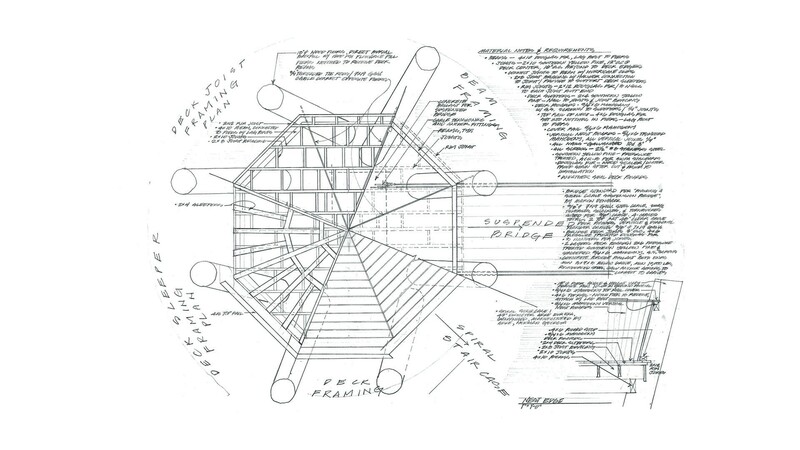 Within its center, the nest contains egg-shaped seats for guests to congregate or sit for various lessons and demonstrations. A narrow, shallow ditch that conveys storm water is located beside The Hill, and will be shaped and planted suggestive of a small stream. Following a rainfall, this bed and the existing ones it flows into will help nurture additional activity and exploration for visitors to the Children’s Nature Discovery Garden.